Known for combining traditional Southwestern and Mexican ingredients, spices and cooking techniques to create delicious food, Z’Tejas Southwestern Grill has expanded its brunch menu with enticing new entrees. With five locations in The Valley, brunch goers will be able to easily indulge in these savory dishes. Highlights of this new mouthwatering menu are listed below. South of the Border Benedicts Crispy mini tortillas topped with a chorizo patty, fried egg, black bean puree, green chile queso, salsa fresco, cotija cheese and served with fresh fruit. Bananas Foster French Toast Walnut cinnamon bread soaked in Z’Tejas’ signature vanilla bean custard, grilled golden brown and topped with fresh roasted bananas foster sauce. Stuffed Breakfast Relleno Fresh roasted poblano pepper stuffed with cage-free scrambled eggs, jalapeno bacon, sausage, salsa fresca and mixed cheese, topped with roasted red pepper sauce and served with black beans and fresh fruit. 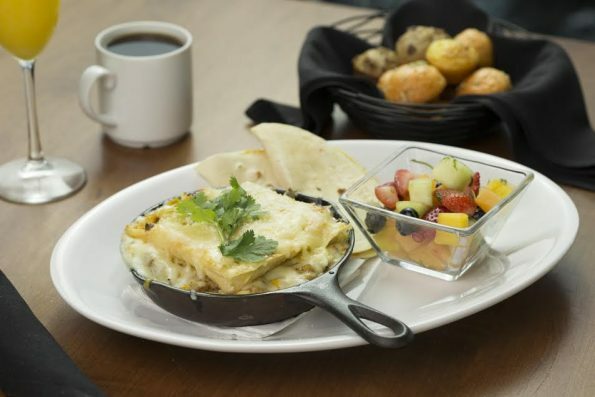 Barbacoa Breakfast Enchiladas Two tortillas filled with slow-braised beef, scrambled eggs, caramelized onions, green chile relish, Jack cheese topped with ancho mole sauce, served with black beans and fresh fruit. Sausage & Sage Puff Pastry Savory sausage, fresh roasted corn, potatoes and sage between puff pastries, topped with Jack cheese in a cast iron skillet and served with fresh fruit. Farmers Market Skillet Fresh mushrooms, spinach and sun-dried tomatoes, sautéed in a cast iron skillet, topped with two made-to-order cage-free eggs and served with fresh fruit. Chicken Fried Chicken & Waffles Crispy, double-breaded fried chicken with creamy country gravy, and fresh-baked Belgian-style waffles, topped with chocolate covered strawberries, served with homemade vanilla bean syrup. Sweet Potato Pancakes Three sweet potato pancakes topped with honey butter and served with homemade vanilla bean syrup and fresh fruit. Additional new items include the Slow Smoked Herb Crusted “Prime” Prime Rib, Meat Lover’s Skillet, Southwestern Breakfast Bake, Smoked Chicken Breakfast Enchiladas, Breakfast Quesadilla, Garden Omelet, Meat Omelet, Buttermilk Pancakes and Fresh Fruit Pancakes. Z’Tejas is also open for lunch and dinner and offers terrific happy hour specials. For more information visit Z’Tejas.com. In 1989, the first Z’Tejas opened in an old Victorian house on historic 6th St. in downtown Austin, Texas. Since then, Z’Tejas has grown to become the premier dining destination for Mexican and Southwestern style cuisine in Phoenix, Arizona, where it has five locations and Austin, Texas, where it has three locations, including the original that still stands at the same old Victorian house on 6th St. You can follow Z’Tejas on Facebook, Instagram and Twitter. For more information, visit www.ztejas.com.